Keeping your gear dry is essential for a great day on the water and it is important to choose a reputable brand when you start your search for the best dry bag. The market is flooded with dry bags and what it comes down to is if you need just a splash proof bag or one that can handle going over the falls. If I’m relying on a bag to keep my camping gear or expensive electronics dry then I’m definitely going to be going with one that can take a dunk and come out on top. You’ll pay more for this up front, but if you get a cheap bag that leaks underwater you’ll wish you had made the initial investment. Dry bags are manufactured to be dry, strong, and light. They accomplish this by using eliminating as many leak points as possible through welded seams and roll tops, and using high quality materials such as vinyl or nylon that can keep your gear dry and resistant tearing. These are the two most common dry bag materials and both have their pros and cons. Choosing the right one for you comes down to your preference and how you plan to use it. Nylon dry bags are coated with a hydrophobic lining such as silicone that keeps it dry. This makes it soft and flexible, but still quite durable as a dry bag. They are rated with a with a denier value, which indicates how dense the fibers are. A higher denier nylon bag will be denser and therefore more abrasion resistant and overall better quality. Nylon bags are also lighter weight than vinyl and stay more flexible in cold weather. Vinyl dry bags are typically tougher and more durable than nylon bags. They are also rated with a density rating that applies to the density of the polyester or polymer fabric under the vinyl or PVC coating. Typical ratings are 500D and 1000D, where once again the higher number indicates more compact fibers. These bags are very waterproof and the most abrasion resistant bags out there. On the downside they do become stiffer in cold weather and can be more bulky than a comparable nylon bag. There are really only two different types of seals to choose from for a dry bag – zipper or roll top. They are fairly self-explanatory and both function very well. The main thing to make sure of is that you’re sealing your bag completely. With a zipper seal this means making sure it is pulled all the way shut so it engages the seal. With a roll top seal this means rolling it tightly a minimum of three times with no wrinkles for a sufficient seal. You can roll more if you want to pack the bag down smaller or don’t trust just three rolls. Dry bag capacity is measured in liters typically ranging from somewhere around 3L to 100L. The sizing may be a bit daunting if you’re not used to it, but most outdoor gear uses a liter measurement for capacity and you’ll adapt easily once you get a feel for it. Dry bags around 10L or less work well for day trips where you only need small items such as phones, cameras, keys, or a quick change of clothes. From there start scaling up your bag size accordingly depending on what gear you need to keep dry on your trip. Splashproof: Withstands light rain and splashes. This is not meant for use in the water, I would limit this to keeping great dry while hiking and occasional splashes. Waterproof: Withstands quick submersion and will float if dropped in the water. This is most dry bags and works well for kayaking, fishing and boating where you may get wet. Submersible: Withstands 1 meter of submersion under water for 30 minutes. This is the ultimate dry bag and will keep your gear dry in extreme and wet conditions. The Sea to Summit Rapid drypack is an excellent choice for a go-everywhere and do-everything drypack. It is designed to be wearable, comfortable, and waterproof, and it excels at all three of those things. I particularly like the quick access zipper pocket on the back because it lets you store your small items without having to dig through the whole bag. The Rapid Drypack also has stiff opposing sides on the roll top which makes it easy to get the perfect seal, and the white interior makes it quick and easy to find gear. It is perfectly suited for river hiking, fly fishing, biking in a downpour, or an ocean kayaking trip. This dry bag is a beast, just like everything Yeti rolls out – see the most overdone five gallon bucket in the world. However, the Panga dry bag is in a league of its own. It has a super thick and durable zipper which is a highly desirable feature, and it is without a doubt very air tight. I challenge you to go to a store and zip the Panga shut and try to squeeze out any air – it is all but impossible. This is the bag that I would put my laptop, phone, and expensive camera gear in. It also has attached straps if you need to take a quick hike or carry it down to your launch point. The 1680 denier nylon construction is just over the top and crazy thick. I saw a review of this where someone dragged it behind their truck on a dirt road with no adverse effects. If you have the money, get this bag. Great bag with a high quality 420 D nylon construction. The Big River Dry Bag is a high quality nylon dry bag with a TPU coating which is environmentally friendlier than a vinyl or PVC coating. 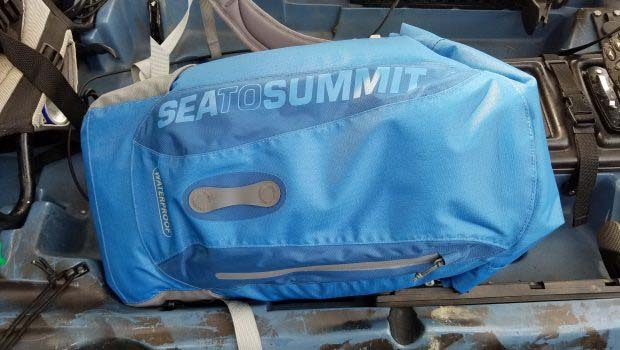 Sea to Summit has a history of creating dry bags that work, and this is one that I trust to keep my gear dry. The hypalon lash loops are also a welcome feature because they are very strong and give a perfect attachment anchor point for your boat. The Big River bag with a 420D nylon construction means it is softer and more flexible than other comparable vinyl bags which is a good thing if you’re trying to squeeze it into a tight spot. My choice is to use the Big River dry bag for river trips where you’ll want to lash it down and keep it secure. If you’re looking for a durable submersible bag with a zipper closure instead of the typical roll top closure then this is it. There are so many things going for this dry bag. It is durable, it is reasonably priced, it is made in the USA, and it looks awesome! In addition to all of that the bag is submersible up to 15 feet, which is actually pretty incredible. It may be hard to actually test that claim since you’d have to get the air out of it, but it’s nice to know that it can go under and stay dry. The Mad Water duffel is the dry bag for a true outdoors-man. 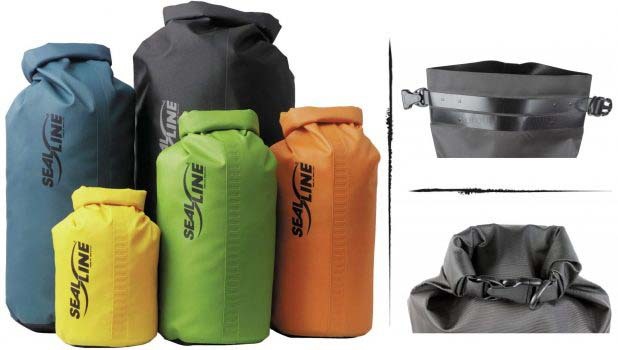 The Baja dry bag by SealLine is one of the most popular heavy duty dry bags out there because it is designed to be very durable. It sets the standard for durability with the heavy weight 1000D scrim reinforced vinyl and is perfect for rocky mountain terrain and rough water. The dual strip seal has a vinyl flap that forms a much better seal than the average roll top dry bag and it can withstand shallow bouts underwater. SealLine offers the Baja dry bag in a variety of sizes ranging from 5 to 55 liters which will cover almost anything you need to keep dry. The Baja bag is what I would chose for a rafting or kayaking trip because it is reasonably priced and it is built for the outdoors. Which material is best for dry bag construction?